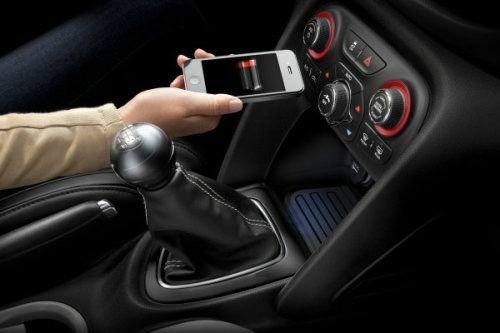 Chrysler is bringing an industry first wireless charging technology to their cars and it will make its debut in the all-new 2013 Dodge Dart. With all the electronic devices today that we have to make our lives more enjoyable, it can be difficult to keep them charged up when we are always on the go. Mopar, Chrysler Group's service, parts and customer-care brand, has developed an in-vehicle wireless device that charges cell phones and other electronic gadgets. The first Chrysler vehicle to get the industry-first device will be the 2013 Dodge Dart that made its debut at the 2012 Detroit Auto Show. Essentially, the car will feature a small pad or shelf where you simply place your phone and it will begin to charge automatically once the engine has started without the need for any cables while you commute to work, run errands or on extended trips. Chrysler announced today the new wireless charger will work on your iPhone, Blackberry, MP3 Players and Droid-based devices. It will be available as a $199.99 option (plus installation fees) from Mopar. With every portable device using their own proprietary charging cable, the new charging station will put an end to the hassle of dealing with all those wires. Chrysler says the new technology uses a power bin measuring 8.27 inches by 9.5 inches by 3.25 inches that will be located just below the center stack and in front of the center console. The power bin will work seamlessly when the customer places their electronic device on the charging pad. A specifically designed phone case is included, that Chrysler says will work with a variety of smartphones. Chrysler didn’t mention which ones specifically. Motor Authority reports the technology has been around for at least a year and Powermat, a pioneer in the wireless charging technology, had received backing from GM Ventures, and had invested $5 million in Powermat to help develop wireless charging pads for GM cars starting with the Chevy Volt. It's not clear if this wireless technology coming out in the Dodge Dart was developed by Mopar or the OEM Powermat took their technology to Chrysler. Regardless of who developed this new device for Chrysler, it should make life easier for anyone who has electronic devices in the car that need to be charged. Anything that simplifies life is a good thing in today’s world that seems to get more complicated with every new technology that comes out. This one will make the new Dodge Dart even more appealing. For a detailed look, watch the video with Mopar President/CEO Pietro Gorlier and Head of Product Development and Sales Jim Sassorossi. What isn't mentioned is that most devices are not made to connect to these inductive chargers. You'll either need a "sleeve" or a phone/device with a specific battery and receiver capable of being charged here. Those will all cost extra, of course. Yes it was mentioned Aaron, they say it is included. Read before rant. Didn't see it in the article and still don't.